Blackberry Jasmine Blast was a tea that I had gotten to sample in store and really enjoyed it, so I decided to buy some to steep at home. This green tea blend has a really nice berry aroma with lovely floral notes. I found that it smells more like roses and hibiscus to me than jasmine, which is likely because those two are just much stronger in fragrance compared to jasmine petals. I got to try this one iced in store and thought it was great. 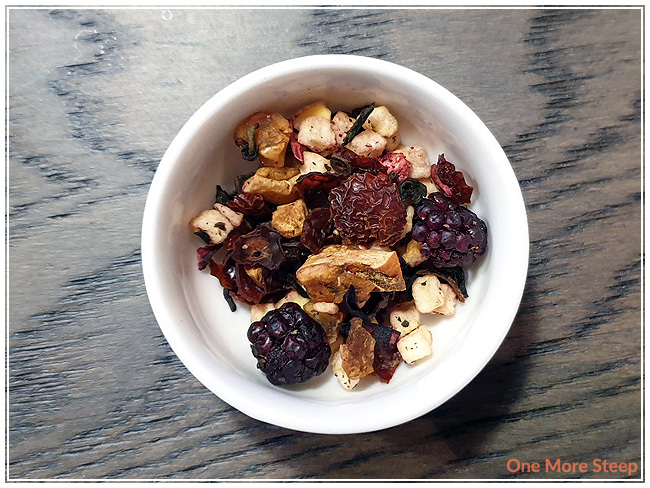 Blackberry Jasmine Blast consists of: apple, green tea scented with jasmine flowers, hibiscus, rosehip shells, blackberries, and natural flavouring. While I can definitely see the apple pieces, I don’t really smell them too much – which I don’t think is a bad thing since apple is often an ingredient that’s present for a general fruity flavour and sweetness. 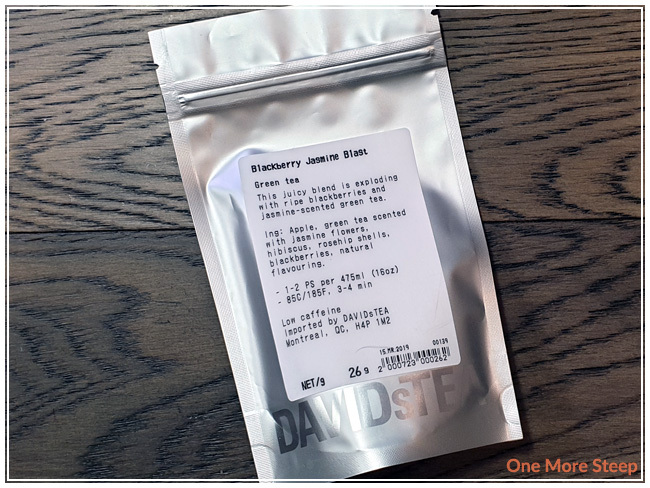 DavidsTea recommends steeping Blackberry Jasmine Blast in 85°C (185°F) water for 3 to 4 minutes. My initial steep was for 4 minutes. Blackberry Jasmine Blasts steeps to a gorgeous deep berry pink colour – a quality that I fully attribute to the hibiscus flowers in the blend. There’s a lovely hint of floral from the tea, but it’s primary a berry aroma that I smell. 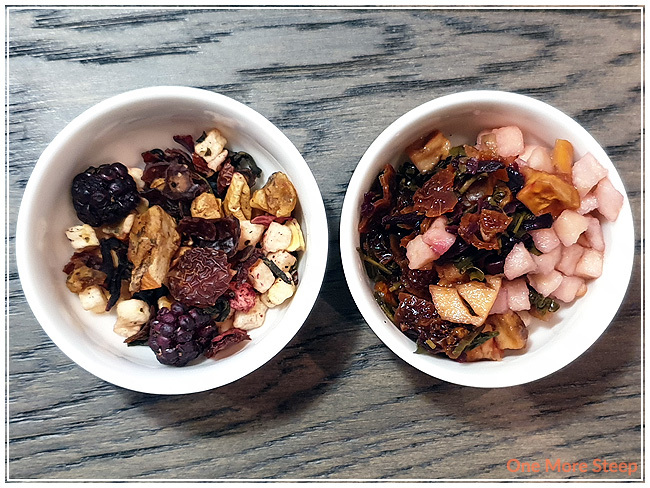 On first taste, I note that Blackberry Jasmine Blast is quite fruity – it has a nice ‘mixed berries’ kind of flavour to it. I found it was light on the floral notes, although it is still present. I taste the hibiscus the most, and very little of the green tea base and the jasmine, which is a bit disappointing (but not surprising given that hibiscus is such a strong ingredient. I attempted to resteep Blackberry Jasmine Blast once and found that the colour and taste was really weak in comparison to the initial steep. My recommendation would be to just steep Blackberry Jasmine Blast once. 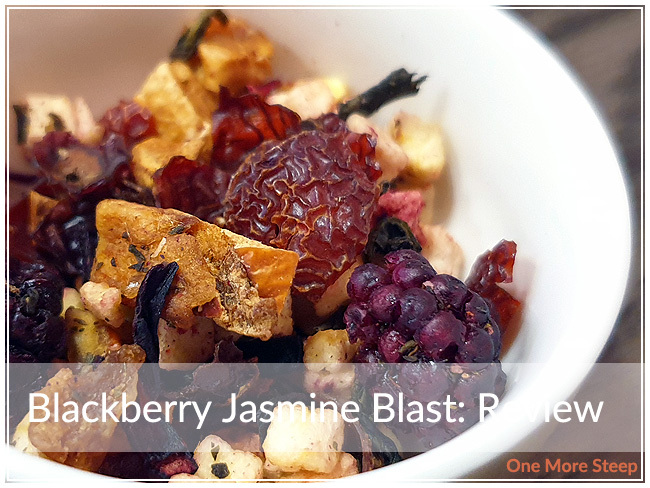 I thought that DavidsTea’s Blackberry Jasmine Blast was just okay. While I really enjoy this green tea blend as an iced tea, I’m a bit disappointed by the lack of green or jasmine in the flavour of the steeped tea. It’s mostly the berries and hibiscus that run the show when it comes to Blackberry Jasmine Blend. 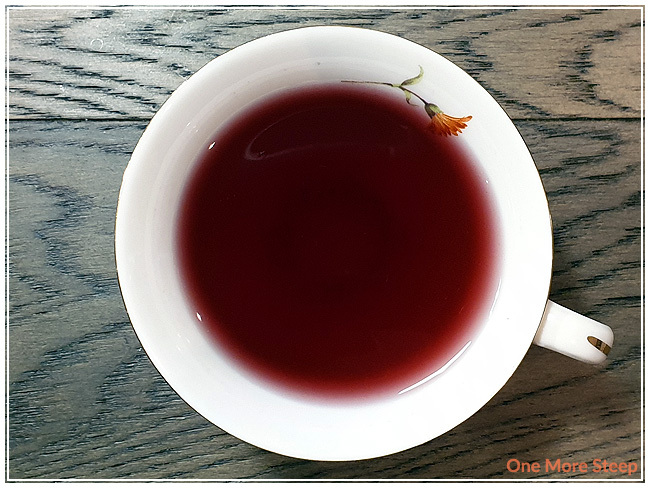 However, as a fruity hibiscus iced tea blend, I would definitely give it a 4 out of 4 since it makes the tastebuds happy as an iced tea – just not as a green tea.